Sometimes, when I’m eating, I just don’t feel the need to be in a fancified warehouse. It’s not that I get vertigo looking up at those high, beamed ceilings, nor do I think about all the bugs and critters that may be inhabiting such lofty wood; these things don’t bother me. Perhaps its just that the emptiness of the space above my head seems to demand filling. Maybe one must look up with soaring ideas of how wonderful the food may be, eyes rolling to the tops of their sockets, tracing the beams, if one is so lucky, to put words to the sublime occurrence dancing across one’s taste-buds. Well, most-likely not. Sitting in a corner booth this weekend at Nostrana, the space above my head felt decidedly vacant. This was to be my second trip to the well-known eatery in a few years and, I feel bad to say, I could never understand how it was ranked Restaurant of the Year in 2006. Don’t worry, I’ve had other things besides the pizza to make sure that my feelings were not in error and, across the board, I’ve felt let down. Their menu seems so interesting, ingredients so fresh; even on the plate the food looks amazing. Once it enters the mouth, on the other hand, not much lives up to Nostrana’s impressive pedigree. I don’t mean to say the food is bad, which it is not per se, its just lacking, as if each dish needed one thing, one spice, one technique to bring all the flavors together, but that something just wasn’t there. As this is a Pizza Review, I’ll leave the other foodstuffs to the side and focus my efforts on a “traditionally” “uncut” Margherita pie. House mozzarella, tomato, basil, with added arugula, and proscuitto. Fancy. I’m sorry that the picture I have doesn’t do justice to the wonderful look of this pie, but you’ll have to believe me that my mouth was watering. With the commencement of the cutting, however, things started to go downhill. In the middle, there seemed to be a pool of the most liquified elements of the sauce and melted cheese, which caused unnecessary difficulty in cutting a slice. Upon reaching the crust with the knife, I had a ball of dough and toppings, which I had to fold over into a sort of calzone in order even to attempt a bite. 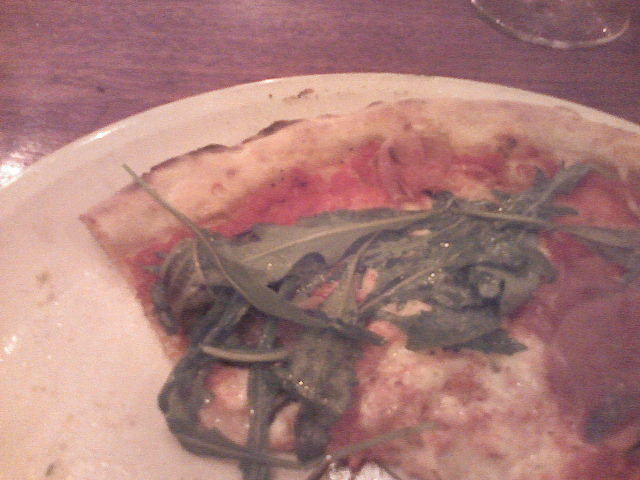 The sauce was good, very simple; the crust, inconsistent; the cheese, a bit over cooked; the arugula, a bit greasy; the proscuitto, very nice. On their own, each component had flavor, texture, and was most certainly fresh, but together, I found them bland. It was as if all the flavors canceled each other out. Very unfortunate. Overall, Nostrana greeted me with high expectations and, when all was said and done, I left unsatisfied and with a hole in my wallet. This entry was posted in Artisanal, SE Portland, Thin Crust. Bookmark the permalink. But that’s just the kind of thing some Faulkner-reading San Francisco liberal would say, right?